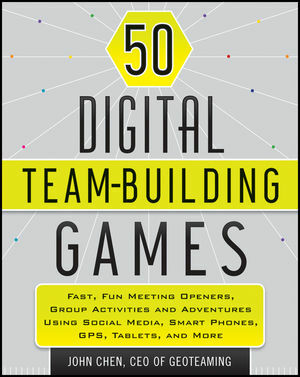 50 Digital Team-Building Games offers fun, energizing meeting openers, team activities, and group adventures for business teams, using Twitter, GPS, Facebook, smartphones, and other technology. The games can be played in-person or virtually, and range from 5-minute ice-breakers to an epic four-hour GPS-based adventure. Designed to be lead by managers, facilitators, presenters, and speakers, the activities help teams and groups get comfortable with technology, get to know each other better, build trust, improve communication, and more. No need to be a "techie" to lead these games—they're simple and well-scripted. Author John Chen is the CEO of Geoteaming, a company that uses technology and adventure to teach teams how to collaborate. Successful technology-based team building can build buzz for your company, build critically important relationships and communication internally, and keep your team talking about it for weeks afterward! John Chen is the CEO of Geoteaming, a technology-oriented team-building company. Previously at Microsoft, he helped ship ten major products over ten years, and facilitated a collaborative multi-team approach to the development of Microsoft Exchange—a transformative product that sold 100 million client licenses and earned two U.S. patents. ?At Geoteaming, John has helped over 950 companies and 50,000 participants produce incredible results, from world-class service to exceeding revenue goals. John has presented at many international conferences including MPI (Meeting Professionals International) and ASTD (American Society for Training & Development). ?His clients include Booz Allen Hamilton, Microsoft, Adobe, Boeing, Motorola, and REI.